Artistic Style and Architecture of the Kizil Grottoes-The Transmission of Buddhist Culture:The Kizil Grottoes2. west of the city ofKucha (�燔� in Aksu Prefecture, Xinjiang Province)(3). Because written records or dated inscriptions have not been found providing hints as to when the grottoes were begun, there is no standard theory on this point. A wide range of theories exist from those positing the earliest activity to have started in the third century, to those suggesting the fifth century. However, researchers generally agree that the caves were probably abandoned sometime around the beginning of the eighth century, after Tang influence reached the area. While little also is known about when the various murals were painted, the German team proposed categorizing the art into at least two stylistic phases, and this system remains in place to this day. 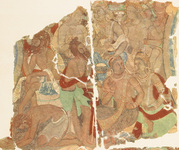 The murals belonging to the first phase(4) are characterized by the use of reddish pigments. In addition, the lines in the paintings are drawn carefully, and gradation shades are blended in order to give a three-dimensional appearance to the paintings. In contrast, murals belonging to the second phase(5) use abundant bluish pigments, which include the use of lapis lazuli. In addition, second phase painting shows large differentiations in pigment shades to give a three dimensional appearance to figures. 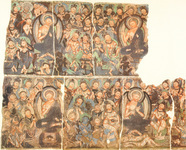 As will be discussed below, many works in the Kizil Grottoes belong to phase 2. Let us now consider the architectural layout of the grottoes. There are three main architectural styles: namely, the central pillar caves, rectangular caves, and monastic caves. However, the most unique architectural features are seen in the central pillar caves(6), which consist of three areas: the main room, the central pillar, and thecorridors. The composition of the murals drawn on the walls are mostly consistent throughout. The architecture of the central pillar caves follows an iconographic programme, functioning as the stage for the carrying out of a Buddhist pilgrimage. Entering the cave, the pilgrim would first contemplate the past lives of the Buddha as he or she passes along murals depicting scenes from these past lives shown on the walls in the main room. As part of this, the worshipper would stop to worship the main figure of Sakyamuni placed in a niche within the main central pillar. The pilgrim would next circumambulate thecorridor moving in a clockwise fashion, thereby worshipping the Sakyamuni statue. Along the back walls of the corridor, the pilgrim would view scenes depicting Sakyamuni’s nirvana and there contemplate his or her own existence in a Buddha-less world. Upon exiting the corridor, the worshipper would view Maitreya (Buddha of the Future) painted on the wall above the entrance to the main room. Kizil grottoes, the vault ceilings of the main room are divided into diamond blocks, decorated with paintings done on these same themes (such as the Jataka Tales(10)and the Preaching Scenes(11)). a mystery. On the left, right, and the back of the central pillars are corridors with low ceilings, and there along the walls are depicted images of donors(12), monks and stūpas. the moment of his death. Finally, we find the Maitreya preaching in the Tuṣita Heaven depicted in the half circle above the entrance of the main room. (Line Drawing by Grünwedel(15)). 上一篇：The Transmission of Buddhist Culture:The Kizil Grottoes1.